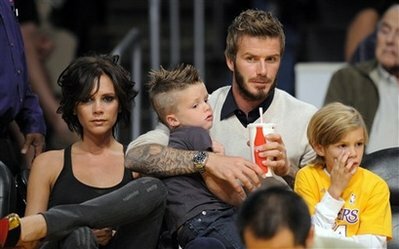 David and Victoria Beckham cheered on the Lakers courtside with their three boys Brooklyn, Romeo and Cruz last night. The boys seemed to be having fun – cheering the players on and getting into the spirit of the game, while mom looked ready for a fashion event dressed in super-skinny black jeans and sky-scraper black and gold Christian Louboutin heels. Cruz wore a vintage Joan Jett, Born to be Bad T-shirt to match his punk rock hair style!